When we think about designing a great user experience, it’s easy to get caught up with all the things. The fonts, the colours, the flows, the content. Everything. But there’s another component to UX that can instantly delight your users that you might be overlooking. I’m talking about microcopy. 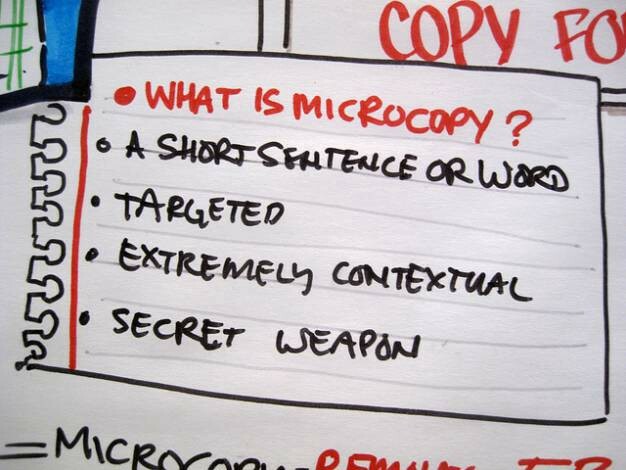 Microcopy is the term for the small bits of copy on a apps’s interface that help users do ‘stuff’. Microcopy examples are error messages, contact form explainers, ecommerce hints. At a glance, these tiny clusters of words seem insignificant when compared to the overall app design. But surprisingly, those tiny words have a huge impact on conversions. But just because microcopy is small, doesn’t mean it’s easy to implement. There are multiple factors that play a role in designing great microcopy. Here are a few tips to make a little bit of text pay off in a big way. Usability testing gives you insights into what parts of the copy are clear, and what confuses the user. Small tweaks can make a huge difference. Analyse the microcopy when things aren’t working. They tested changing the phrase from “Request a quote” to “Request pricing” and saw a 161.66% increase in clicks to their lead gen form. Encourage users to think out loud as they complete tasks and you’ll learn a lot about your copy from what they say. Revise your copy based on insights gained in A/B Testing. Your microcopy can also objection-handle any doubts a user has about registering, subscribing or buying. You should anticipate user’s questions. User testing is a great way to find out what kind of questions users are asking. Fear of Spam: Whilst ‘not to auto-tweet’ might be taken for granted by good marketers when asking for twitter connections, the user is less than sure. Microcopy from Timely covers all the potential user concerns in one tight little sentence. Why Do You Need That?! Facebook addresses all user’s concerns, head-on, in its signup box. Their form explains the service is free (forever), and if you’re nervous about giving your date of birth it deals with that too. The purpose of using clear labels and explanations in forms and their fields is to neutralise any potential input problems. 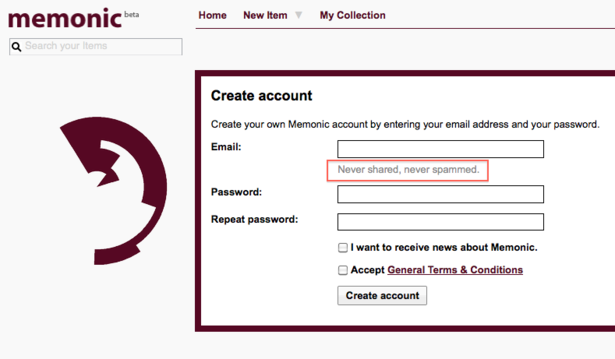 Microcopy should address all user’s concerns. When something goes wrong, it’s helpful to know exactly what happened. But if you aren’t explicit about the error, your users are going to have a hard time figuring out how to fix it. Talk to your user like a person. Have a conversation and convey technical information in simple terms. Think about the actions and results you’re looking for. When implementing microcopy use simple unambiguous language and short snappy sentences. Users don’t want to read long instructions on how to complete a single task. It’s supposed to be microcopy, not a long paragraph of content. There’s nothing wrong with reminding your customers or subscribers they are about to do a very smart thing. 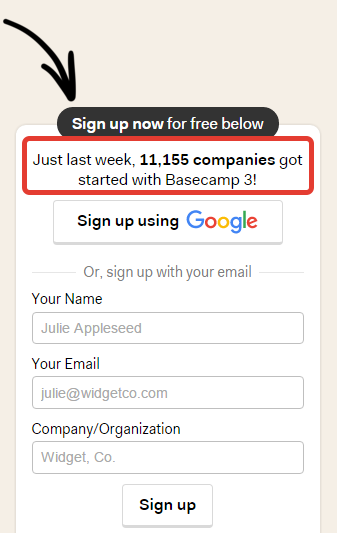 So feel free to add a little boast like Basecamp does. It does no harm to a sign-up page to give the impression of recency by pulling in numbers like this. But you should find the right balance. If you show unnecessary information all at once, you will clutter your UI and strain your users’ cognitive load with unnecessary information. Show microcopy only when the user enters a state where it becomes necessary. Microcopy can’t fix every usability issue. It simply can’t guide the user through a bad UX. If there’s a problem with the design, then fix the design. Well-written microcopy guides users, and poorly written microcopy confuses and frustrates them. So, the next time you’re creating or improving an experience, I hope you employ some of the tactics provided here. Nick is an UX specialist who runs UX Planet - a popular publication for designers.